In her garage-kitchen, Mrs Kyriakoula Petrakis cooks up to four meals every day for different family members. 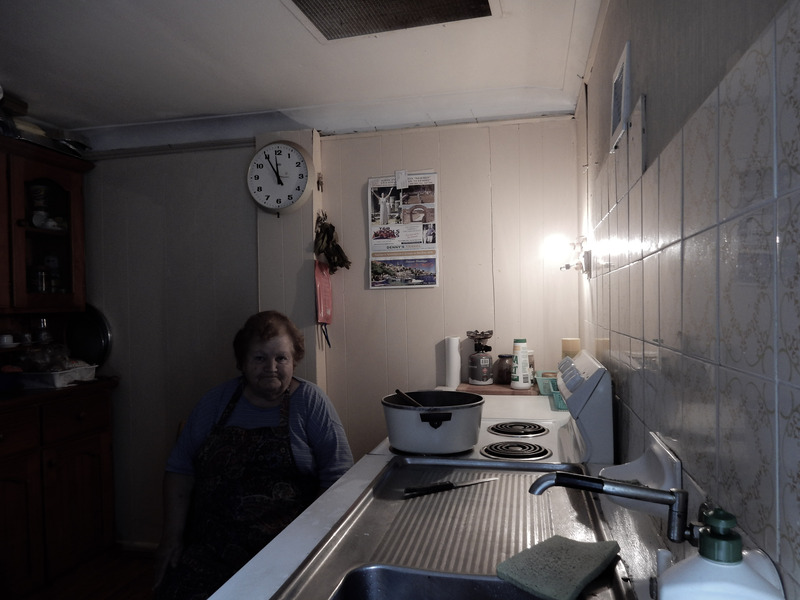 Since arriving in Australia from Greece with her husband in 1967, Mrs Kyriakoula has lived in the same Marrickville House, where she raised three children and several grandchildren. During the early 1970’s, not owning a car meant her family had no use for the garage and driveway, and decided to convert the garage into a kitchen. The transformation of space preserved the inside kitchen and the larger area allowed for the accommodation of more people. The garage-kitchen is fully equipped with an industrial size deep freezer, separate standing fridge, kitchen table, floor to ceiling cabinet, stove and sink fit out, and ornate tile splash back. Forty years later, although the family now own a car and their children have long moved out, the garage-kitchen and driveway remain integral spaces for cooking, eating and family gatherings. “We ate and we lived here and outside. The house inside is always immaculate. Birthdays, Christmas and Easter – everyone meets here. This is our place.” – Dina, Mrs Kyriakoula’s daughter. By the time I had arrived at Mrs Kyriakoula’s home at midday, she had already cooked Fasolada (white bean stew) for a cousin, and had begun Spanakorizo preparations for me. In the afternoon Mrs Kyriakoula would make Kima (mince meat) for her grandchildren’s after school meal. Later that evening, Mrs Kyriakoula would cook dinner for her loving husband, who repeatedly referred to her as “my beautiful wife”. Although Mrs Kyriakoula was suffering from muscular leg pain that day, she was adamant to continue her daily cooking ritual. While simmering the Spanakorizo, Mrs Kyriakoula asked her daughter to place a chair next to the stove in order to rest her legs while she intermittently stirred the rice. This is not an image of a woman who is idle, but that of one who spends most of her time standing.